RCH Yoshimura Suzuki Factory Racing riders Broc Tickle and Justin Bogle turned in strong performances aboard their Suzuki RM-Z450s in Saturday’s annual Memorial Day weekend Lucas Oil Pro Motocross Championship event at Glen Helen Raceway in San Bernardino, California. Tickle logged a 14-4 performance and was credited with a seventh-place overall finish while Bogle notched a 12-5 effort and was scored eighth overall. With two of 12 rounds complete, Tickle currently sits eighth in the American series, but a slim three-point margin leaves him within striking distance of Jason Anderson in sixth; while only five separates him from the top-five. Meanwhile, Bogle leaves Glen Helen ninth in the standings, with only four points between him and his team-mate. Tickle was eighth-fastest in Saturday’s final qualifying session but struggled out of the starting gate in the first moto. He raced through the first corner of the opening 30-minute-plus-two-laps moto in 15th and spent the rest of the session trying to reel-in the top-10 riders. 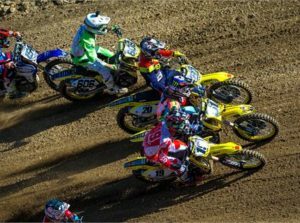 Unfortunately, with less than five laps to go, the Michigan rider stalled his machine, leaving him 14th when the flag waved on the first 450 class moto of the weekend.